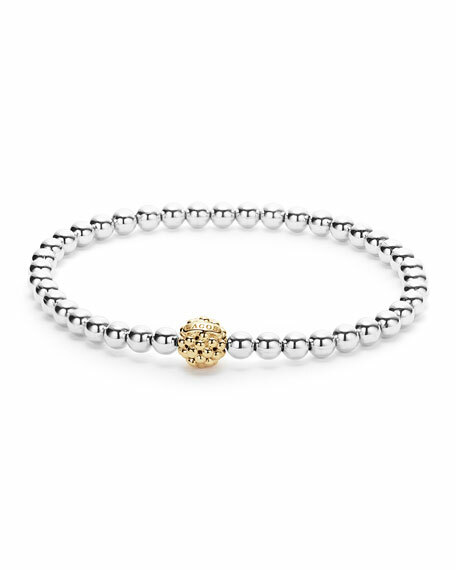 LAGOS Icon bracelet in sterling silver with signature Caviar detailing. 18-karat yellow gold center ball station. For in-store inquiries, use sku #2063414. John Hardy reversible bracelet. From the Classic Chain Collection. 18-karat yellow gold and sterling silver. Box clasp with pave-set white diamonds. 0.16 total diamond carat weight. 17.8 cm or 7"L. Handcrafted in Bali.